Optimizes the filesize of png images. Is there a better alternative to PNGCrusher? Is PNGCrusher really the best app in Image Editing category? Will PNGCrusher work good on macOS 10.13.4? PNGCrusher is a simple app that optimizes the filesize of PNG images. Just drag any number of PNG files onto the app and they will be processed by the open source OptiPNG, which provides better compression rates than the standard pngcrush. If you deal with png images a lot, especially in Web development, this app could save you time and bandwidth! Note: Not all PNGs will see a noticeable change in filesize. Some are already as compressed as they can get. PNGCrusher needs a rating. Be the first to rate this app and get the discussion started! 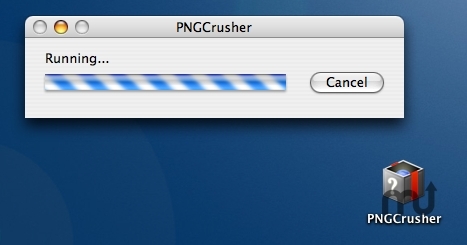 Caution: PNGCrusher replaces your original files with optimized ones, but only if the compression can be improved. All of the caveats of OptiPNG also apply to PNGCrusher.